Led Zeppelin is now in a literal battle of the bands over the rights to its biggest song “Stairway To Heaven,” in an interesting twist related to a copyright decision handed down by the Supreme Court in June. The case of Petrella v. MGM was decided by a 6-3 margin in the Court, with the unusual combination of Ruth Bader Ginsburg, Sonia Sotomayor, Elena Kagan, Antonin Scalia, Clarence Thomas, and Samuel Alito on the majority side. The liberal-conservative alliance agreed that the daughter of Frank Petrella, who wrote a screenplay about boxer Jake LaMotta, can pursue a copyright damages case against Metro-Goldwyn-Mayer Inc. over profits from the “Raging Bull” movie. The decision focused on an important aspect of copyright law known as laches, which sets a time limit on how long someone can wait to file a lawsuit. Paula Petrella’s copyright suit in 2009 contended she should receive some of the profits from the re-release of “Raging Bull.” MGM argued that laches prevented Paula Petrella from waiting for several decades to file a lawsuit. “In sum, the courts below erred in treating laches as a complete bar to Petrella’s copyright infringement suit,” said Justice Ginsburg, who wrote the majority opinion. The precedent allowed plaintiffs like California’s estate to pursue a copyright claim more than 40 years after the alleged songwriting infringement, with the goal of having a jury trial settle the issue. 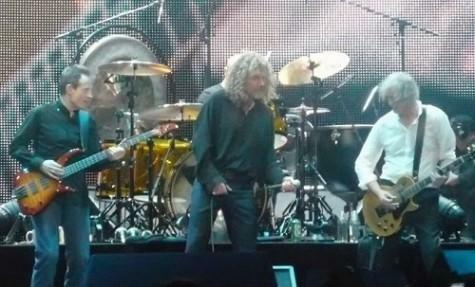 After the song’s release, California’s band, Spirit, played six concerts with Led Zeppelin. In 1971, Led Zeppelin released the song “Stairway To Heaven” as part of its Led Zeppelin IV album. Led Zeppelin at first challenged the selection of Pennsylvania as the venue for the federal trial. “The individual defendants are British citizens residing in England, own no property in Pennsylvania and have no contacts with Pennsylvania, let alone ties sufficient to render them essentially at home here,” the group’s attorneys said in a memorandum to dismiss. Last week, U.S. District Court Judge Juan Sánchez dismissed the jurisdiction claims by Led Zeppelin’s lawyers and the case will proceed. In several prior copyright lawsuits, Led Zeppelin settled out of court after claims were made that parts of Led Zeppelins songs were based on the other works of artists. On October 27, the band is scheduled to re-release the album containing “Stairway to Heaven” with an alternate mix of the iconic song included in the expanded offering.